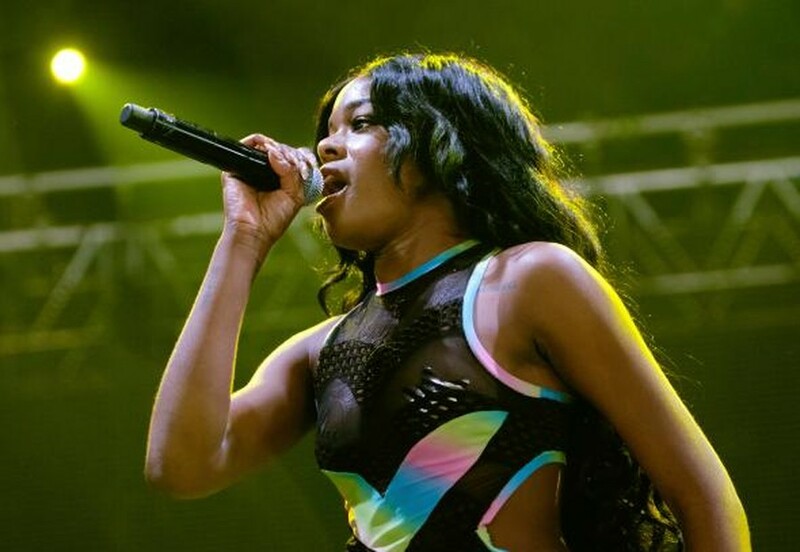 “What you gun’ do when I appear?” Azealia Banks nearly screams on her breakout single, “212.” Simultaneously a challenge to her then-contemporaries and a self-assured statement of purpose, “212” served to catapult the young Banks from internet darling to rap superstar overnight. Between then and now, Banks has released only a handful of singles, a wildly-acclaimed EP, and a mixtape, each release showcasing what the Harlem native does best—quick-witted rhymes effortlessly flowing over beats produced by some of the best names in underground electronic music. Three years post-“212,”during which time a debut album was promised, delayed, and delayed again, finally the long-promised Broke With Expensive Taste has dropped. In the past three years, not much about Banks’s style has changed. Part of her appeal is her unique selection of producers. To many, the names are unknowns, but to those versed in the underground club scene (a scene which Banks both honors and capitalizes on), names like Machinedrum and Lone are sure to spark interest, and their contributions to this album are some of the standouts. As she did on 1991, Banks here rhymes mainly over a mix of house, dub, and trap beats–a sound that only years later has grown close to gaining mainstream exposure (see Vic Mensa’s recent stellar single, “Down on My Luck”). What sets this album apart from Banks’s sparse earlier work is her exploration of sounds that she previously left untouched. “Gimme a Chance,” the second track on the record, is first held together with a thick double bass line and a flurry of horns before smoothly transitioning into a salsa-rap hybrid, complete with Banks singing and rapping in well-practiced Spanish. Other experiments on the album are less successful, including an ill-conceived collaboration with indie rocker Ariel Pink, which serves at best to provide some sonic variety, and at worst as a poor attempt at a rock crossover. Fortunately for the listener, the rest of the album showcases Banks in top form. Unlike her contemporaries, Banks avoids saturating her debut record with too many guest features. Save for one cut, “JFK,” Banks takes charge of all the singing, rapping, and occasional yelling on the record. Taking center stage, Banks shows off with a no-apologies swagger, throwing out lines like, “My attitude is b****y, but you already knew that,” from record standout “Chasing Time,” which is at once a dig at a former lover and a sarcastic note to her critics who constantly lampoon Banks’s tendency to engage in flame wars across social media. Other highlights, the AraabMuzik produced “Ice Princess” and the SCNTST cut “Soda” may finally give Banks the radio voice that she rightly deserves, but other inclusions may leave some listeners baffled. One particular slap in the face is the inclusion of her now-aged single 212. While still arguably her best track, it feels a touch insulting to keep fans waiting for years and still include the track that made her a star. Other cuts, like “BBD” and “Luxury” stand as some of the best songs, but have also been around for nearly two years. Luckily, at 16 tracks, these older songs are balanced by a large volume of new material. At just over an hour, the record may seem a bit long, but instead of falling into the trap of front-loading all the best songs, the album always feels appropriately paced. The sonic variety also contextualizes previously-released tracks “Heavy Metal and Reflective” and “Yung Rapunxel,” whose seeming left-field production now sounds perfectly at home. After such a long time, Banks’s largest barrier to success is a fan base cockteased into apathy. Three years ago, Banks sang “They’ll forget your name soon, and won’t nobody be to blame but yo’self,” retrospectively both a dig at her rap rivals and a prophetic statement about her own future. After so many delays and seemingly empty promises, most of Banks’s fan base no longer cares. Broke With Expensive Taste may be her best offering yet, pushing the boundaries of her own unique sound while still remaining club-(and radio-)friendly. After something like 10 listens, the album is certainly good enough to silence most of her critics, but after all this time it remains to be seen if it is good enough to make people care again, and ultimately, make Banks a rap superstar.